Ahhh...internet, Mystery be thy name! My entire post about Meyer Lemon Curd VANISHED! Maybe Curds around the world ganged up on my little site for swearing I'd never make it again. 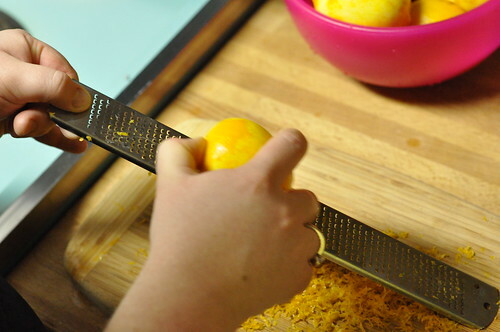 From what I hear you don't want to see how sausage is make, and I think that the same might be true for Lemon Curd. The amount of yolks and butter will make your heart stop, but the comparative deliciousness makes the process mouthwatering!!! I doubled the recipe and got 4 half pint jars and a mini! I'm not sure if I'd do that again, just because there is something about staring down at 12 egg yolks that...I have no words for it! There are lots of recipes out there for Lemon Curd, but I used the one at Food in Jars! When I make it again, I'll post more pics of my process! Special thanks to my dad, the master gardener, for passing the Meyer Lemons on to me! !